Discover why Lefty's Gourmet Pizza is one of the best places to eat delicious Italian food in Colorado. Our delicious homemade pizzas and Italian dishes melt in your mouth, leaving you full and happy. Be sure to stop in and meet, Lefty, our owner and one-time rocket scientist. His stories about discovering the rings around Neptune make for great family entertainment. We live by the slogan "Once you've tried honey, you don't go back to vinegar" and we know that with one bite of our wonderful pizza you won't go anywhere else. Let our friendly, professional staff take care of you at your next party. 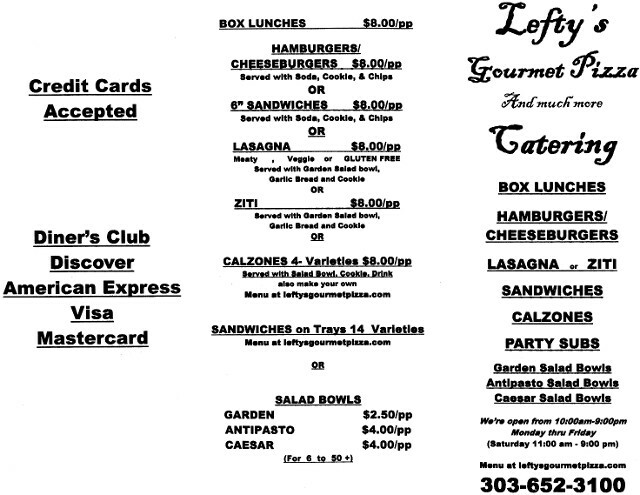 Lefty's Gourmet Pizza has expert catering services that provide the quality you deserve at an affordable price. From field trips and business lunches, to dinner parties and events, our special catering menu has a variety of options to meet your needs. 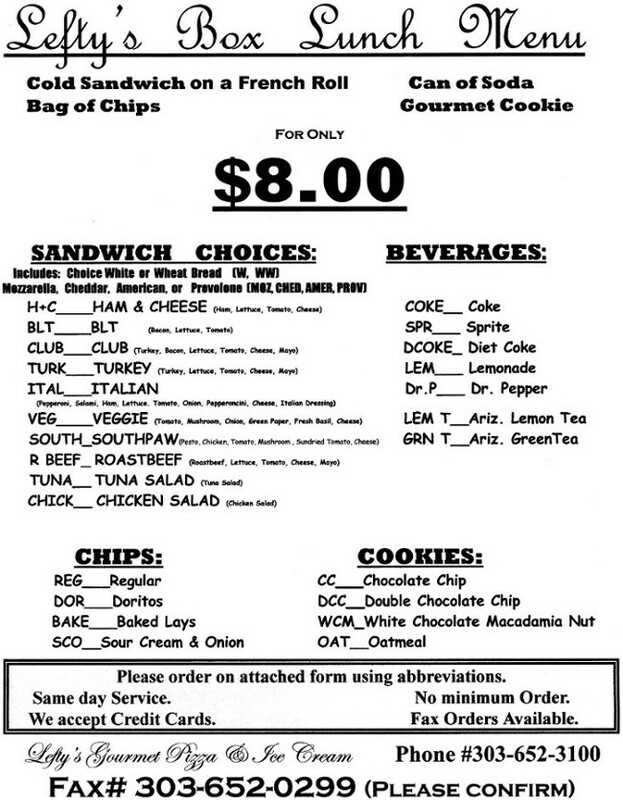 Our box lunches include 6" sandwiches, chips, soda and a cookie that are great for a business meeting. If you want to try something different, try our individual serving of lasagna with salad, garlic bread, and a cookie for $10.00 per person or try a small calzone, salad and cookie for the same $10.00 per person. Call us today for more information about our catering services. Contact us today for more information about our catering and delivery services.